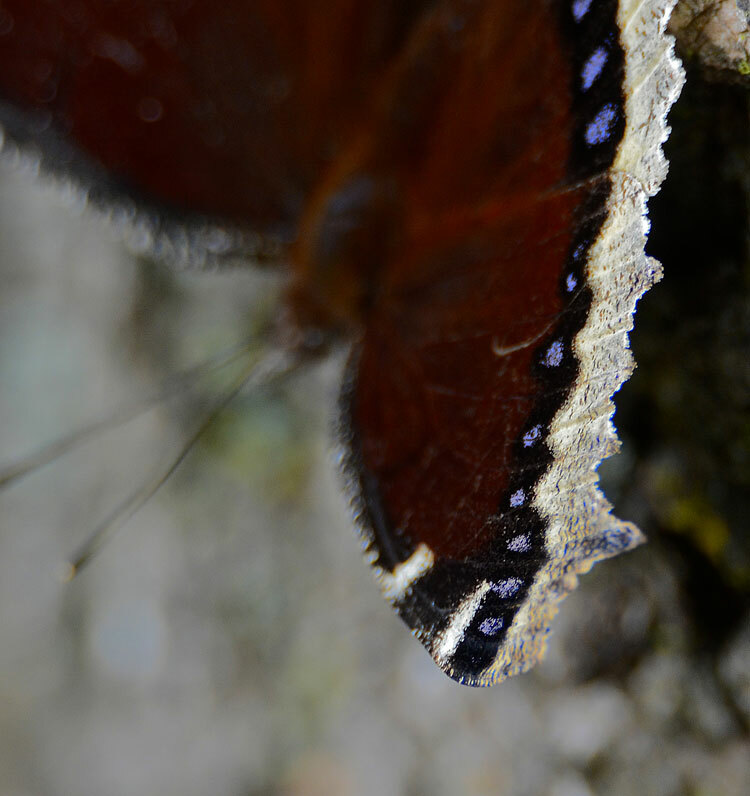 I photographed this Mourning Cloak butterfly at about 4:30 in the afternoon. The sun was bright and washed out the butterfly's color. Here the butterfly appears to be trimmed in white, but really the edge is yellow. The bright light also brought out a reddish cast on the wings, but when not in bright light, the dorsal side of the butterfly looks more like a dark brown or velvety black. Against the black, the border is noticeably more yellow. 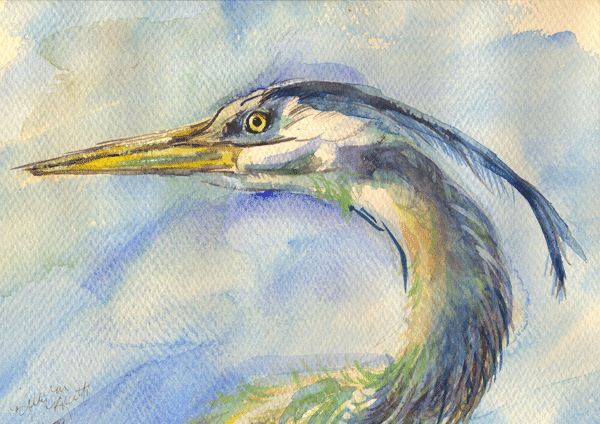 The same shade of iridescent blue spots show in dark or bright light. Morning Cloak butterflies are called "brush-footed butterflies" or "four-footed butterflies" (family Nymphalidae). They have six legs like any other insect, but you can only see four of the legs. The other two are very small and resemble brushes. They are tucked up underneath the butterfly's "chin," and are not used for walking or perching. To read a little more about brush-footed butterflies, click here. 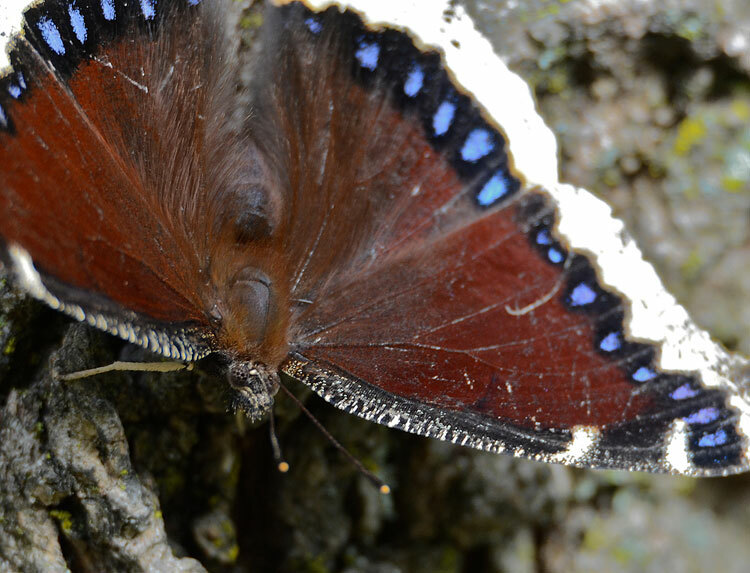 The ventral side of the Mourning Cloak butterfly looks wrinkled and bark-like. The dark, black color helps it blend into the tree bark. Mourning Cloaks love tree sap, so it's great camouflage. Additionally, this photo clearly shows how the butterfly looks like it only has four legs. 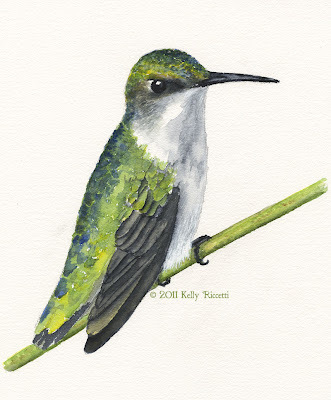 The last two legs are small and brush-like, and make the butterfly look like it always needs a shave! 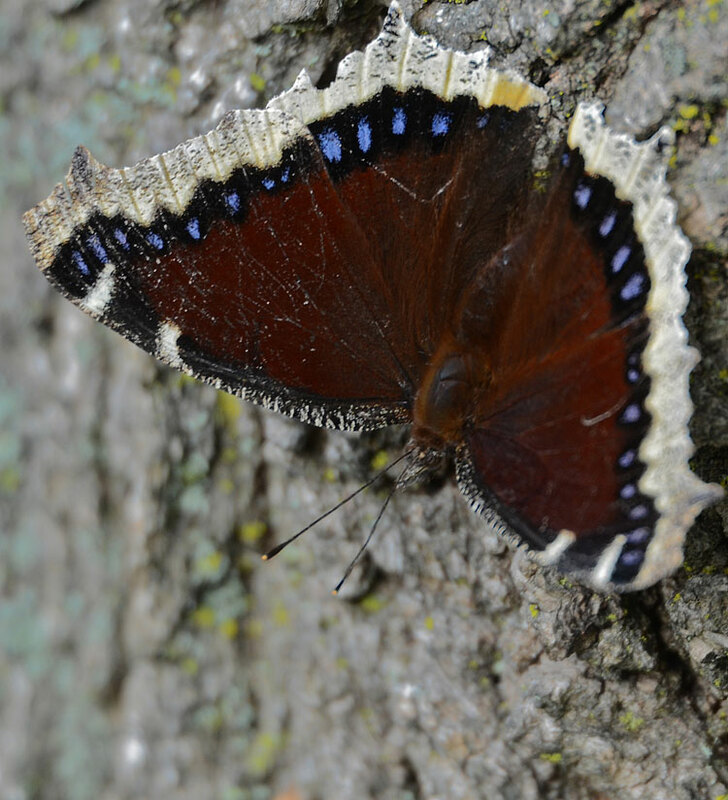 A Mourning Cloak butterfly tucks itself up into a cedar tree for the evening. I was surprised as I watched it land on the tree and then slowly crawl deeper and deeper into it. By the time it was all the way tucked in, I couldn't see it anymore. 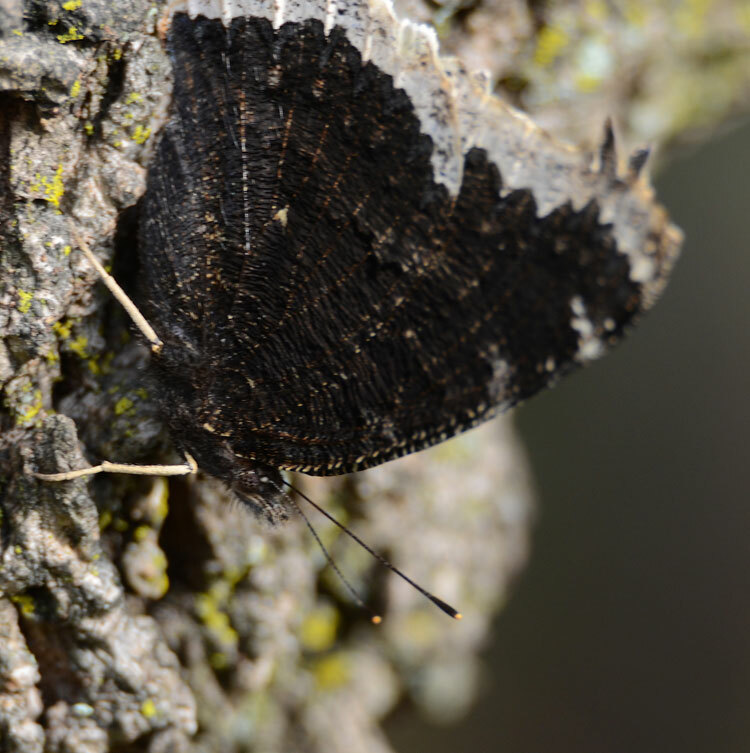 Mourning Cloaks are one of the longest-lived butterflies in Ohio (can live 8-10 months). They overwinter here by hibernating through the winter. I'll have to keep my eye on this tree. It is well protected and would be an ideal place to hibernate. 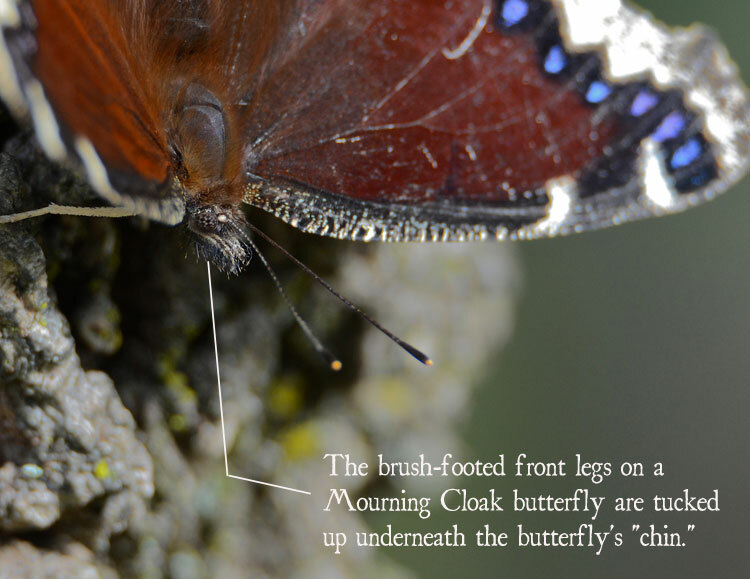 In the spring, Mourning Cloaks are one of the first butterflies to take flight, and I have seen them flitting on sunny March days when snow is still on the ground! 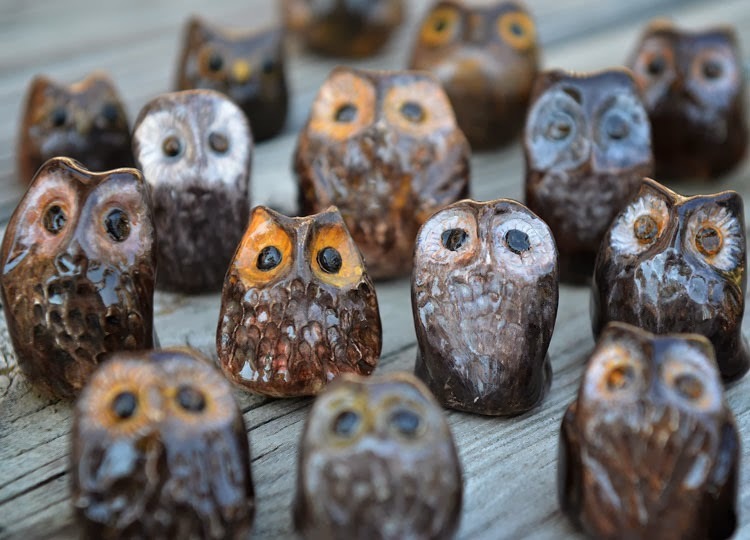 Since they are dark, they bask in the sun to raise their body temperatures for flight. They are solar powered on those cold days! Being sap lovers instead of flower nectar lovers helps these butterflies because they have a ready food source as soon as the sap starts to flow. Mourning Cloaks also love to feed off rotting fruit. This summer, I started a little area in my "wild patch" part of the yard where I would dump fruit that had started to turn before we could eat it. I put it out there for the hummingbirds, because I know they love to nab fruit flies from the air, but maybe the little fruit dump helped to lure these butterflies in too. Fascinating, as always. And again your use of different focal points helps a lot as I try to visualize your information. Sorry to hear this brown is a little misleading--I like it a lot. What are the two little brush legs for? Are ash trees surviving anywhere? Enjoyed reading your blog, very informative. We don't see this species in Hong Kong. Thanks for sharing. Banjo...thank you! In our area, no ash trees are surviving. We had it professionally treated for 3 years, but the bugs still took over. There are supposed to be some treatments that do work, but they didn't for us. Untreated trees are dying quickly around Mason now. You can see them everywhere. ...they use their little brush feet to clean their antenna. 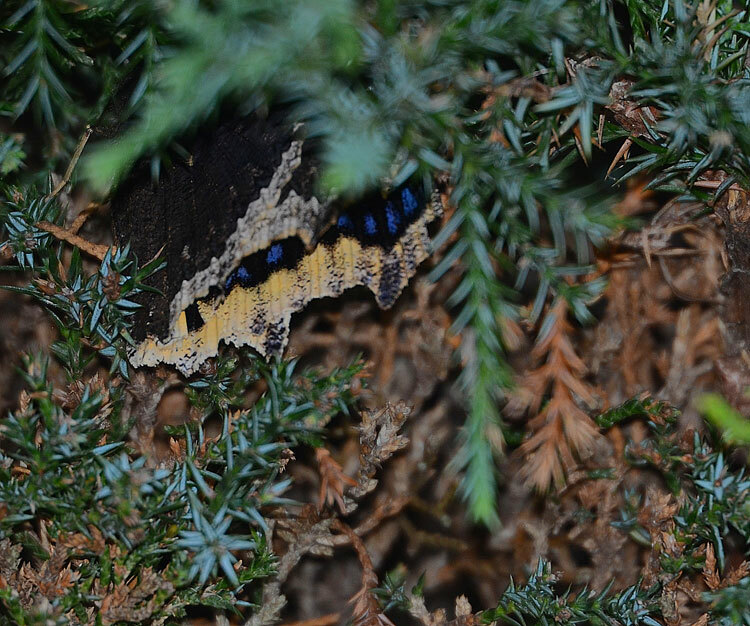 We have a fair number of Mourning Cloaks here and I always enjoy seeing them they are so beautiful and their life cycle means that we can see them when there are no other butterflies around. A lovely post. Stunning captures! And so Educational! i will have to watch for them, knowing they may be around in the cooler weather. we did get some this spring. our dogs had torn off some bark from one of our smaller trees in the yard. all the butterflies would cluster on it, sipping the sap as long as it ran. and thank you for the explanation on brushfoots. i had seen that term but didn't realize what it meant. Great shots, Kelly! I used to see a lot of these early in the season in Ballard Park in Newport. Oddly enough, we had a good few hanging out in the garden center at work earlier in the Summer. Now I'm wonering if it was the trees we carry that attracted them. Hi Kelly. A very interesting and informative post. I know it is sad to loose your Ash but at least it has its uses for other species, like the Mourning Cloak. Fantastic. I always learn so much from your posts. Wonderful images and information. Fascinating critters, wonderful pictures, thanks for the information about them and their life cycle. Very interesting, Kelly! 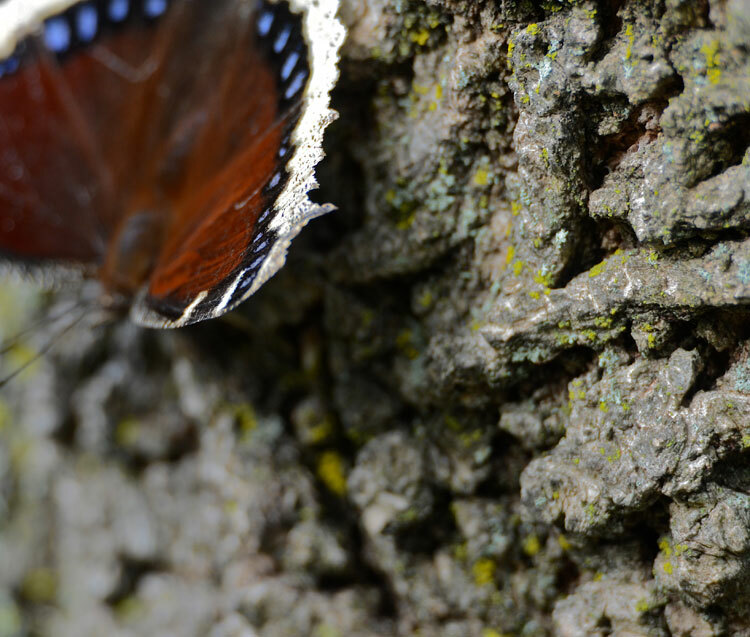 I never knew that butterflies like tree sap or that some prefer cooler weather. You always prompt me to do a little extra reading. Wonderful post, Kelly. You do a great job of introducing folks to the lesser known butterfly facts. They are not all flowers and Monarch-like migration. I never knew that about Mourning Cloaks. I used to see lots of them on the farm where I grew up, but not so much where I live know. I do remember seeing one this Spring, however, on the siding of our house. Nice pictures, like you always show us. Wonderful nature lesson and wonderful photos. I love the wing details! I didn't know half this stuff! Thanks Kelly! thank you for sharing this information and your lovely photos of this beautiful butterfly. ...thanks, everyone! Yesterday I looked out the living room window and saw 3 Mourning Cloaks feeding at one of the sap flows at the same time. They looked so pretty in the shadows. The butterflies continue to swarm the tree...Red Admirals and Red-spotted Purples were most numerous after the Mourning Cloaks. Don't know how I missed this post, Kelly! I always learn something when visiting your blog. Your photos are wonderful. 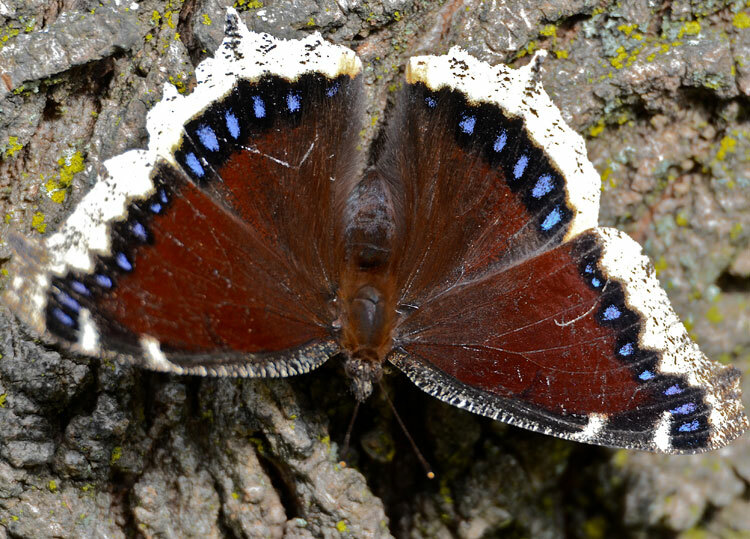 I have never seen a Mourning Cloak butterfly. yours is simply my favorite blog of all. Thank you.